Melt 3 tablespoons butter. 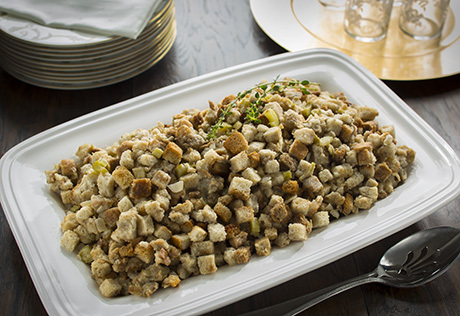 Stir the stuffing, celery and onions in a large bowl. Add the broth and melted butter and toss to coat. Layer and/or fold heavy-duty aluminum foil to create a 6-layer rectangle, about 16 inches long by 4 inches wide. Press the foil rectangle lengthwise into a 6-quart slow cooker to line the side of the insert opposite the control panel (this is where the heating element usually is- the foil will help distribute the heat). Grease the inside of the cooker not covered by foil with the remaining butter. Spoon the stuffing mixture into the cooker. Cover and cook on HIGH for 3 hours. Serve immediately or cover and keep on WARM for up to 2 hours. Stir lightly before serving.